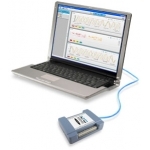 MCC's Ethernet-based data acquisition solutions are ideal for portable or distributed applications. E-1608 offers low-cost multifunction analog and digital I/O. 6000 Series modules offer built-in signal conditioning for strain, temperature or voltage and include Encore software for data display, analysis, and reporting. The StrainBook is ideal for strain gage applications for 8-64 channels. WEB-TEMP and WEB-TC modules feature a web server/web page interface allowing temperature monitoring from anywhere there is an internet connection. Ethernet-based DAQ board with 8 analog inputs, 250 kS/s sample rate, 2 analog outputs, one 32-bit counter input, and 8 digital I/O. Board-only Ethernet-based digital I/O board with 24 bit-configurable DIO lines, one counter input, and header connectors.